I have spent a lot of my spare-time on this project, composing and producing the songs on the piano and on the computer. As a complete amateur I want to share with you the way I did it and hope you get inspired to do something similar! I plan to do a series of blog posts telling my experience as a musician, giving tips and ideas. This first blog post is for the first song I composed for my wedding with Carol: Friendship! First check the final result: Friendship was composed for our friends. We used it for the entrance of our groomsmen and bridesmaids. If you enjoyed the song, you can have it for free! It is possible to download the song from SoundCloud. You can also download the sheet on my MusicaNeo website. Think about your friends and good moment you had with them. Think hard and think sincerely (close your eyes if necessary). Start playing something on the piano. Something bizarre if necessary, but start something!! Don’t stop. Just keep playing varied stuff that comes out of your mind. Keep playing for several minutes until your mind is fully empty. Listen to the recording and replay the parts you loved. You can do several piano brainstorms throughout some days. Then, you should be able to select the best themes you got and work on them, like polishing your precious piece. After that, you make a first recording on the computer. I used Apple’s Logic Pro X to record and edit my songs. I have chosen Logic because I found it very simple to use when compared to other software. Using Garage Band is a good free alternative, and there are other nice software you can use, like Sonar, Acid or Ableton Live. The advantage of buying a song production software is that you have much more control of your song than with free alternatives like Garage Band. You have good results with Garage Band, but tools like Logic make your songs more professional. I connected my YAMAHA P-85 digital piano on my Mac using YAMAHA UX16 MIDI-USB original cable. Using the UX16 is essential if you plan to record your sustain pedal. I have the original LP5A 3-pedal unit for my P-85 and only UX16 were able to send the correct MIDI signals to the computer. If I try to use other cables, every time I press a pedal, the computer plays a note :-\. After the cable setup, recording on Logic was very easy. The Grand Piano samples that comes with Logic is just fine for a start. I recorded my overall idea for the Friendship song, like the sketch, using the metronome. Metronome makes things easier if you plan to manually edit your song later, so I strongly recommend it unless you need to do something very different in terms of tempo. After recording the piano sketch, I decided to record the Strings. 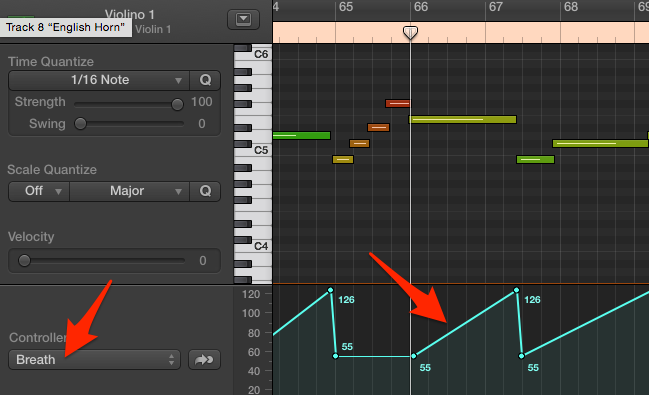 The problem is that the Violins samples that comes with Logic are terrible! I tried many tricks, tips from forums and Youtube videos, but the results were frustrating. I found the result just not realistic, very artificial. 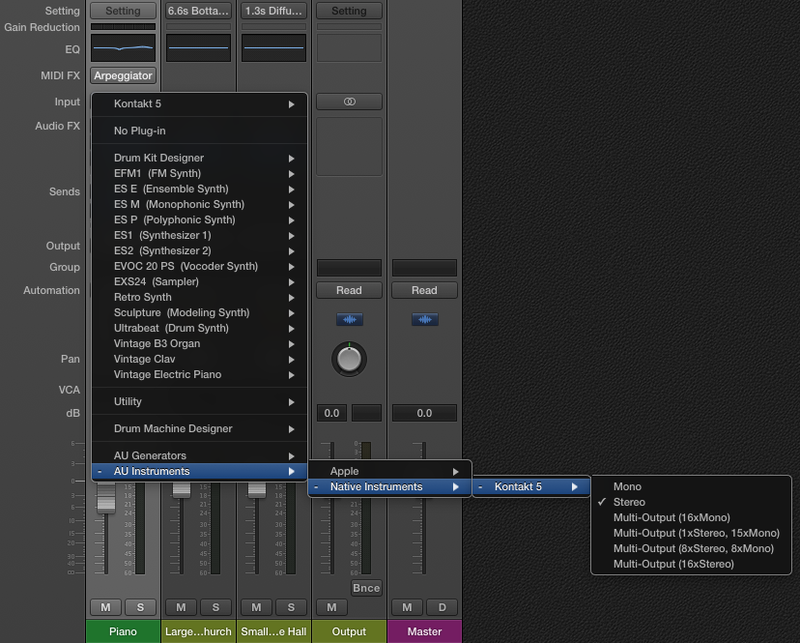 After doing a lot of research, I bought the Cinematic Strings 2 library (CS2) to produce more realistic strings solo. Cinematic Strings 2 may not be the best sample library in the market, but I had limited funds, so I found that CS2 was the best cost-benefit for me. Using CS2 library really changed my motivation positively. I got very excited with the results and put a lot of strings on my first composition (maybe too much strings :P). I used tips from Youtube to make CS2 look even more realistic. 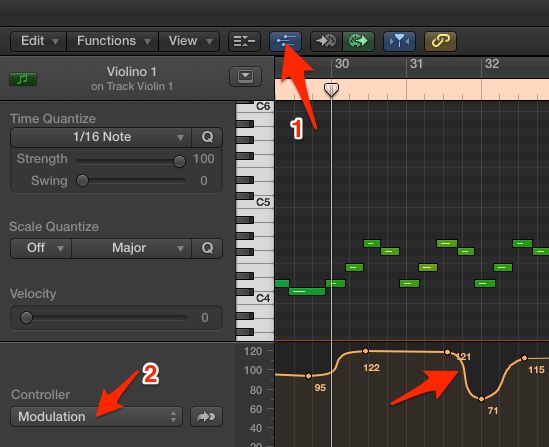 Editing the modulation and volume like explained by this tutorial is essential to produce realistic strings arrangements. You need a lot of patience and always remember that sometimes less is more. Avoid putting too much sounds together inadvertently. As an example, in Friendship, I achieved good results customizing the modulation in the part between 0m:50s and 0m:56s of the song. You can hear this part of the song on the SoundCloud link in the beginning of the post. My intention was to force the sensation of breathing between two phrases of the song. To edit the modulation, press E on you keyboard to open the Piano Roll. Then follow the instructions of the pic below. You can hear this part of the song between 1m:54s and 2m:00s. Producing realistic vibratos also depends on tuning Modulation and Volume. So, spend some time playing with those settings. My main critic regarding CS2 is the lack of more vibrato control. The vibrato amplitude in CS2 is limited. However, the library is well balanced and generally produces good results for you. That’s it, hope you enjoyed!